Tasha Pointer, the new head women’s basketball coach, brings a wealth of experience at major programs, as well as Chicago roots, to the Flames program. Pointer spent the 2017-18 season as an assistant coach at Northwestern, following a two-year stint at St. John’s. She helped lead the Red Storm to the Big East tournament championship and an NCAA tournament berth in 2016. Prior to her time in Queens, Pointer was on the legendary C. Vivian Stringer’s staff at Rutgers for eight years. In that time, she was part of six NCAA tournament teams, including an Elite Eight squad and a Sweet Sixteen group. 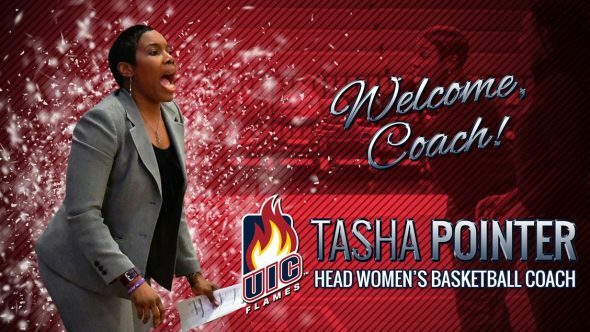 “It is an honor and humbling experience to lead the University of Illinois at Chicago’s women’s basketball program,” Pointer said. “I grew up locally on Chicago’s West Side, refining my basketball skills against some of the greatest individuals to play the game. I also developed as a student with the Chicago Public Schools system, primarily due to a supportive network of teachers and administrators who challenged me daily to be purposeful with life. Their collective work grants me the opportunity to return to this great city and impact more than I ever imagined. Pointer has mentored four conference Defensive Players of the Year, two Rookies of the Year, 18 all-conference selections, and over a dozen WNBA draft picks. She was instrumental in recruiting some of the nation’s top high school players, resulting in three recruiting classes that ranked third in the country and an additional top-10 group. A Parade First Team All-American and the Chicago Sun-Times Player of the Year out of Whitney Young High School in Chicago, Pointer starred at Rutgers. She led the Scarlet Knights to their first Final Four appearance in 2000 and remains the program’s all-time leader in assists, and second on the steals list. During her senior season, she led the NCAA in assists on her way to becoming an honorable mention All-American and a finalist for both the Naismith Player of the Year and Nancy Lieberman Awards. Pointer scored 1,456 points in her decorated career and accumulated four triple-doubles. She was named to the Big East 25th Anniversary Hall of Fame Team, and is a member of the Rutgers Hall of Fame. Before returning to her alma mater, Pointer coached for two seasons at Columbia and one at Xavier, where the Musketeers won the Atlantic 10 championship. During Pointer’s lone season at Northwestern, the coaching staff helped lead the squad to a second round appearance in the Big Ten tournament after an opening round win over Wisconsin. At St. John’s, Pointer’s commitment to defense was evident. The Red Storm ranked in the top three in the Big East in scoring defense, field goal percentage defense and rebounding defense. Two different players were named Big East Defensive Player of the Year in Pointer’s two seasons, and three Red Storm players earned First Team All-Conference status. St. John’s cruised to the 2015 Big East tournament championship, allowing just 51.7 points per game in their three victories. Pointer and the Rutgers staff experienced tremendous success in the first part of her tenure there, then after a season of adversity, showed resilience as they rebuilt the program back into an NCAA force. The Scarlet Knights played in the second weekend of the NCAA tournament in each of Pointer’s first two seasons on the bench. They advanced to the Elite Eight in 2008 and the following year, Rutgers made the Sweet Sixteen. NCAA appearances continued to reward the Scarlet Knights over the next three seasons, which saw Rutgers win 30 Big East games overall. Pointer helped engineer a return to the NCAA tournament in 2015. In Pointer’s one season at Xavier, she worked with freshman forward Amber Harris, who became the Atlantic 10 Rookie of the Year in addition to being named to the First Team, All-Rookie Team, and All-Defensive Team. The Musketeers won 26 games, were the A-10 tournament champions, and appeared in the NCAA tournament. Pointer’s reputation as a tenacious recruiter is well earned. She brought the nation’s top prep point guard to Rutgers in 2013, among other top talent over the course of her career. A four-year starter at Rutgers, Pointer became one of the top point guards in program history. She was the 1998 Big East Rookie of the Year and a two-time First Team selection. Pointer led her class to 10 wins in the NCAA tournament, earning two NCAA All-Tournament Team selections. She led the Big East in assists twice. The WBCA and the Associated Press both placed her on their honorable mention All-America teams twice. She was voted the team’s MVP or co-MVP all four years in Piscataway. Pointer left Rutgers as the school’s all-time leader – men’s and women’s – in assists and steals. She still holds the NCAA tournament record for assists in a game, with 18 against Stephen F. Austin in 2001. She led the Scarlet Knights to unprecedented success in the NCAA tournament, where they won multiple games in three seasons. She graduated as the eighth all-time leading scorer and still has the top two single season assist totals in program history. Pointer became a high school legend during her playing days at Whitney Young on the Near West Side. She averaged 25.4 points per game her senior year and led the Dolphins to the Public League championship in 1995. She was rated the No. 10 player in the country as a senior by Blue Star Report and was a first team Nike/WBCA All-American, in addition to earning Parade All-American status. She was named to the Chicago Tribune’s RedEye All-Chicago Women’s Legends Team alongside such luminaries as Candace Parker and Tamika Catchings. Pointer received her bachelor’s degree in journalism and mass media in 2001 and a master’s degree in education administration and supervision in 2003 from Rutgers. She is married to Kwabena Yamoah and they have two daughters, Nariah and Anaiah.